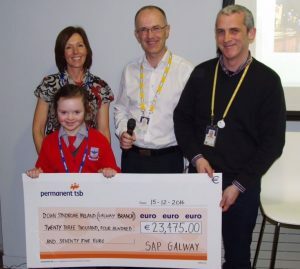 Our thanks to SAP (Galway) for their charity partnership during 2016. We are extremely grateful for their support throughout the year, from in-house fundraising events to supporting ones of our own. For the grants received to run camps/workshops for our members, which were supported by SAP employees and their volunteer programme. Well done to all involved in the many activities organised and ran this past 12 months, raising the fantastic sum of €23,475 for Down Syndrome Galway and our services.